The day started well, as we have finally taken delivery of our (slightly damaged) total station and the rest of our equipment from DHL. This has allowed us to set out the site grid and start recording finds properly. The arrival of a marquee has also made it possible to shade diggers from the rays of the sun for part of the day. Our cleaning of the plaza has been somewhat slow. We are starting to feel the effects of the loss of two students to illness and the absence of two workmen whom we had hoped to borrow from the sopraintendenza. In short, work has been painfully slow, and we have had to make an email appeal for local diggers to join us as volunteers. This has met with some success, and we hope to have three more diggers next week, plus another two from Germany. The site itself is starting to make some sense. The cleaning is revealing that we have lost the paving slabs over most of the plaza, and indeed the mortar level into which they were embedded. Indeed in places the cleaning has directly revealed the fill layers dumped into the bath complex which seems to lie under the forum. Thus we have lost both the occupation and surface layers of most of the square. 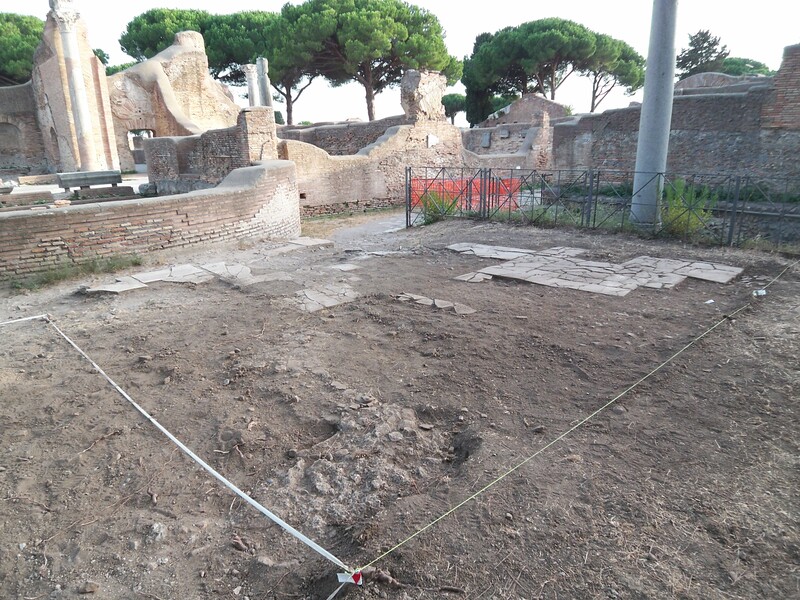 Our chats with workers from the sopraintendenza have revealed other features: several recent excavations on the plaza have taken place, revealing parts of the ‘baths’ close to the surface: these can now be delimited as areas not to dig. Interesting objects are continuing to come out of the cleaning process, as detailed in our ‘finds’ section. The most striking have been pieces of inscription, a die, a key, and the base of a glass jar. The later particularly impressed the tourists, who we began to take over the site yesterday. Most were quite learned, and all enthusiastic. Their donations just about paid for lunch, though will not really be able to make up for the extra expense made on equipment in the first week, when DHL failed to deliver. We have also invested in a larger Italian coffee maker, so as to offer them and our students more refreshment on site. Dear Luke Lavan, Hallo Axel Gering! 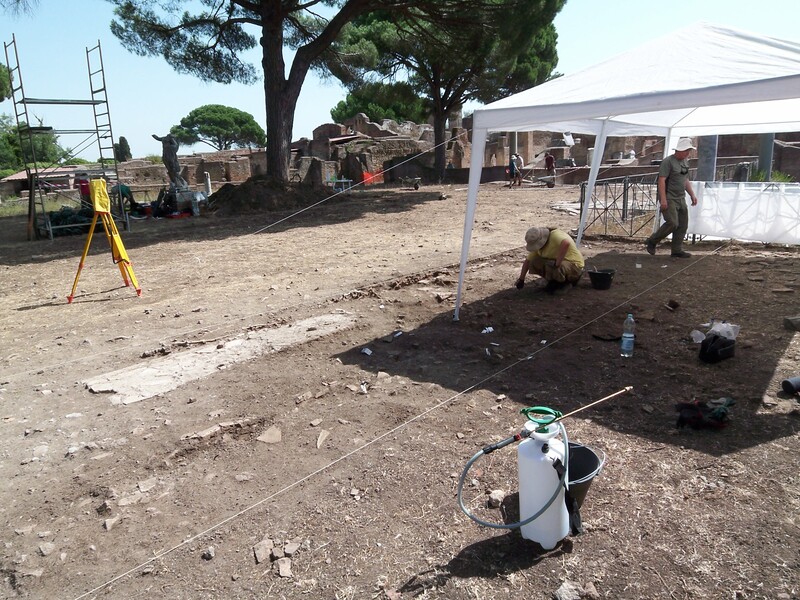 Your cry for volunteers made the way to Australia (Duncan Keenan) and came back Rome – AUR and JCU are in their 1st/2nd week of this Fall semester, and I may ask archaeology students to help out. Most of them have classes and can only work from Friday to Sunday. Please let me know if you still need someone, and under these conditions. j.koehler@aur.edu, or jkoehler@johncabot.edu. Anyway, I would really like to meet you in September on your dig. I’ve been following your posts with interest. The last paragraph of this one references a “finds” section (I’m particularly interested in the epigraphic finds), but I can’t locate that “finds section.” Can you provide a link?